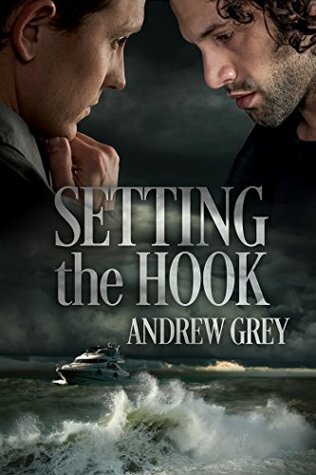 I really enjoyed Setting the Hook by Andrew Grey. I thought it had a well-developed plot and enjoyable characters. The story was also nicely edited. Mike Jansen owns the Apalachicola charter fishing service and runs it with his friend Gordon, aka Bubba. He lives with his daughter Carrie and his mother in the small town of Apalachicola, Florida, where being gay isn’t accepted, and so Mike lives in the closet and hasn’t had a relationship since his days in the Navy. For four years he’s had a repeat customer (William) who comes down twice a year and hires him for a day of fishing. Mike isn’t afraid to admit that he has a crush on William and that it gets harder to control his attraction each time they see each other. William Westmoreland has let his father run his life for too long. His father paid for his schooling and told him what to study so that William could take over the family business (which is located in Rhode Island) when his father retired. However, being stuck in an office and going to meetings all day isn’t what William wants to do with his life. Twice a year he goes on vacation and unwinds by chartering a boat and going fishing. He first hired Mike from a recommendation and continued to hire him over the next four years because he had a crush on him. Over the four years, they become friends. Both men are masculine and easily pass for straight, and that’s part of the problem. They both think the other is straight and so they haven’t done anything about their attraction. Not that they know their attraction is mutual. A hurricane that doesn’t go the way it’s supposed to and a broken down rental car are the catalyst they both need to give into the attraction that has been brewing between them. But will they be able to bridge their differences? Will William move so that they can be together? Will Mike come out of the closet? Will William stand up to his parents? To find out, you will have to read the book. You won’t be disappointed that you did. I know that I wasn’t. I loved how the story ended, and I can’t wait to read my next Andrew Grey book.